Louis Saldenah was born in Trinidad & Tobago and came to Canada in 1970. He followed in the footsteps of his father, the legendary Harold ‘Sally’ Saldenah, one of Trinidad & Tobago's most renowned Carnival bandleaders. In 1977, he produced his first mas band ‘Shangri-la’ which went on to win the coveted Band Of The Year Honors. His exceptional organizational, management, financial and people skills, have propelled him to create the most spectacular parade presentations that Toronto has ever seen. Louis has captured the Band of the Year honors 16 times. 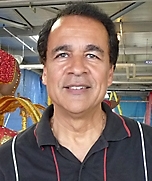 Louis’ creative life, growth and development of this art form have significantly contributed to the creation of this innovative art attraction which has grown to become Toronto’s "theatre in the streets" resulting in Toronto becoming host to one of the largest Carnivals in the world. Louis' artistic vision and creativity have caused excitement, inspiration and joy to tens of thousands of Canadians, foreign spectators and masqueraders.